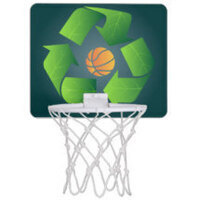 Join ELSB's Green Initiatives during Ecolympics 2019 for Trasketball in front of the SAC and the Red Barn on March 1st. Come test your sustainable waste disposal skills and see if you know what can be composted, recycled, and what must be sent to the landfill. We will be giving away various prizes including UofL basketball game tickets, T-shirts, and more!